2017 August pictures for week of the Aug. 21st to Aug. 25th by Author Scot Fin. Full size slideshow at the bottom of this post. I think there’s more than one indicator in this picture that I’m not in Berkeley, California. I do understand, however, this bookstore was founded by three people from California. 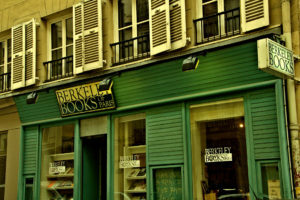 It seems as you get closer to the Sorbonne, more and more little bookstores start popping up. This one is fairly well known; not like a Shakespeare and Company (not too far away), but fairly well known in the bookstore world. I shot this maybe 20 minutes after going by the crowd at Shakespeare and Company and, well, no crowds here. Granted it doesn’t come with a view of Notre Dame, like Shakespeare and Company, but it is on a quintessential Paris street, Rue Casimir Delavigne, on the way to the Luxembourg Gardens. 2017 August images for week of the Aug. 14th to Aug. 18th by Author Scot Fin. Good idea. I love London but I’m not sure this sign has completely had the desired impact. London, however, does try to respect people with initiatives such as these Public Spaces Protection Orders in The Royal Borough of Kensington and Chelsea. 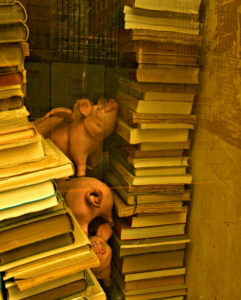 Galerie Vivienne in photos for week of the August 7th to August 11th by Author Scot Fin. Full size slideshow at the bottom of this post. I think I’ve been reading and writing too much. Starting to see flying pink pigs. Actually, it was good to see my friends were still at here after a few years. 2017 August photos for week of the July 31st to August 4th by Author Scot Fin. Full size slideshow at the bottom of this post. 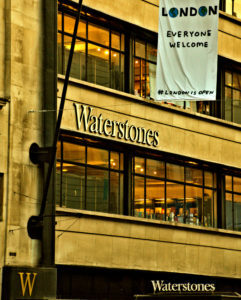 Waterstones has the books, London has the heart. I noticed this banner outside Waterstone’s book shop but it is prominently displayed throughout London at this time. The hashtag on the banner #Londonisopen.